Access to site must be over a hard road capable of supporting a fully laden vehicle. The delivery vehicle must be parked on firm, flat ground. 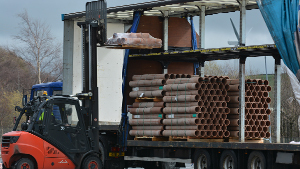 Pipes are typically delivered to site in packs weighing between 1 and 2 tonnes. Fittings are usually supplied in crates or are shrunk wrapped. Any loose fittings should be removed by hand from the delivery vehicle before other goods are unloaded. The prime-mover is detached from the trailer-load and is operated as a fork-lift to unload the packs and crates. For this purpose, approx. 10 metres of firm ground are required alongside the trailer. If conditions allow, packs may be placed around the site in order to reduce subsequent handling. The packs and crates can be offloaded by fork-lift, or by suitable crane, or other machine using a sling. Check that the pack is stable and that the pipes and packing woods are undamaged before cutting the straps and manually unloading. Set the pack down on a firm and level surface. Rest the bottom row of pipes on battens to keep them clear of the ground and stake the end pipes in order to prevent movement of the stack. Store indoors in a clean area, away from sunlight. Extremes of temperature must be avoided. Winter conditions, in particular, can affect the ability to make a joint if items have been left outdoors. 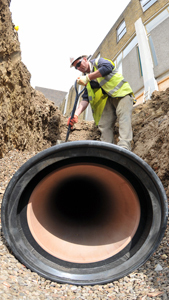 There should be at least 150mm width of trench on each side of the pipe barrel, in order to provide sufficient space for jointing and proper compaction of the bedding and fill materials. It is not good practice to excavate a trench too far in advance of pipe-laying. Do not exceed the specified maximum trench width without prior approval of the supervising authority, because the trench width affects the loading on the pipeline. When trenches are battered, the maximum allowable trench width must not be exceeded below a point 300mm above the crown of the pipes. Always provide adequate support to the trenches, for the protection of workmen and to prevent damage to adjacent property. The attention of all site personnel should be drawn to the requirements of the Health and Safety Executive. Ref. BS8000: Workmanship on Building Sites Pt. 14: Below Ground Drainage. CIRIA R97 Trenching Practice. The correct pipeline alignment and gradient are indicated by laser equipment or by using a taut string and sight rails. Pipe manufacturing tolerances need to be taken into account when assessing line and level. For guidance in setting out see CIRIA A Manual of Setting Out Procedures. Compact the bed to the correct level. Commence pipelaying from the lower end of the line. Lay pipes with their couplings facing upstream. Take care to achieve continuous bedding support. If it is necessary to raise a pipe to the correct level, the pipe should be removed and additional bedding material compacted along the full barrel length – prior to relaying. Blind the trench bottom with a 50mm thick layer of concrete. Place concrete support blocks on the trench blinding, immediately downstream of each pipe coupling position. Place a compressible board on top of each block and lay the pipes on these. Fine adjustments of the pipe levels can be achieved by using wedges fixed between the pipe barrels and the blocks. To maintain flexibility at joints, fix compressible boards immediately upstream of couplings at the specified intervals along the length of the pipeline. Brace the pipes to prevent any tendency to float when the concrete surround is placed and vibrated. Before laying, check the pipes and fittings to ensure that they have not suffered damage. Make sure that the pipe ends, jointing components and lubricant are clean from grit, before attempting to make joints. When laying clay pipes, it may be convenient to check that all is in order by applying interim air tests to progressive lengths of pipework as work proceeds. Blow or pump air into the pipeline until a pressure slightly more than the required air test pressure is indicated on the manometer. After allowing 5 minutes for the temperature to stablise, adjust to the required pressure and commence the test. (a) If the measured drop is less than the allowable drop then the test is passed (see table). Note: The test pressure LA is the same as that previously used in the UK except that the test period is increased for sizes above DN225, as shown. The above standards do not regard an air test alone as sufficient grounds for rejection and it is recommended that a water test should be applied in the event of apparent failure to meet the air test. An apparent failure of air test can be due to causes other than defects in the pipework; for example, changes in ambient temperature. At the upstream end of the pipework to be tested, add a 90o bend and sufficient vertical pipes to provide the required head of water. BS EN1610 requires a minimum 1.0m (10kPa) head of water at the high end with a maximum of 5m (50kPa) at the lower end. Both heads above the pipe crown. In cases of very steep gradients, it may be necessary to test the pipe stages, in order to comply with these limitations. Tighten stoppers at the lower end of the pipeline and at open branches, after checking that they are clean and well-fitting. Strut the ends of the pipeline and the 90o bend to prevent movement and then fill the line with water. Inspect the pipeline for any obvious leaks and remedy any defects. There will be an initial fall of the water level due to absorption and the displacement of trapped air. After at least one hour, top up to the maximum test head, a longer period may be allowed in extremely dry conditions. The loss of water over a period of 30 minutes should then be measured by adding water from a measuring vessel at regular intervals of 10 minutes and noting the quantity required to maintain the original water level. The test is accepted if the water added does not exceed 0.15l/m2 of internal wetted area over a 30 minute period, for pipelines. Higher limits are set for pipelines including manholes and inspection chambers.